VHF radio is the preferred form of communication in South Australian coastal waters. 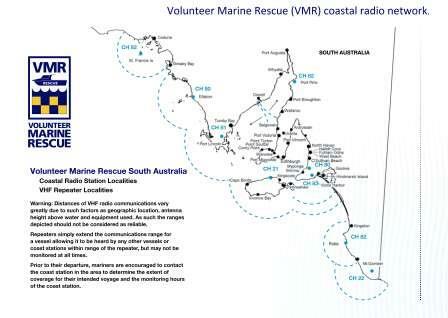 We and the VMR associations periodically monitor the South Australian VHF repeater network. 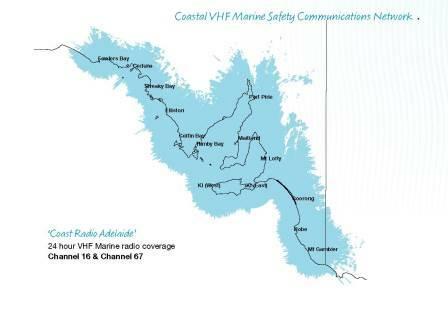 This network is complementary to the State Government funded Coast Radio Adelaide VHF 16/67 network. receive distress and emergency transmissions. You need to use recognised radio procedure and keep transmissions brief. The following times currently apply for monitoring hours, scheduled contacts - or skeds - and regular weather reports. Note: You may request weather reports from Coastal Stations outside of routine broadcast times. Warnings issued by the Bureau of Meteorology will be broadcast as they come to hand. Some Coastal Stations offer 'sked' calling services. Mariners wishing to ask about or be included in 'skeds' should contact the relevant Coastal Station. You should contact the relevant Coast Station as soon as possible after launching or putting to sea. always monitoring relevant distress frequencies 27MHz Ch 88 / VHF Ch16. Note: A mobile telephone is useful but is not a substitute for a marine radio. If you intend operating a motor boat in Unprotected Waters, you must have a marine radio aboard that is in working order. It must be capable of communicating with a shore based station. You must know how to operate it. Volunteer Marine Base Stations are periodically manned by volunteers. Please note these details are subject to change without notice. Newly opened bases may not be fully operational. The VHF repeater coverage is shown on the maps below. Click on the map to open the image in PDF. Volunteer Marine Rescue Association locations.